Ethan Hunt the name is just enough to remind you of the Mission Impossible. Coming this Friday 9th July Ethan Hunt aka Tom Cruise sets out on a new mission but this time the plot is different, the character names are different and the movie name is different. Being accompanied by Cameron Diaz from the Chalie’s Angels fame sets out on a new mission. Tom Cruise aka Roy Miller is out on a secret mission and to help him Tata Photon has brought out a new interactive contest. 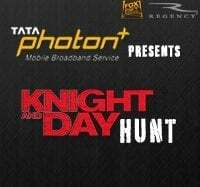 Where in users have to crack codes by loggin into Tata Photon Facebook page or follow them on Twitter and play the challenge to win free movie tickets to Knight & Day, Cool Swiss Knives and Instant Recharge Batteries everyday. 1. Become a fan of TATA PHOTON FB page or a Follower of @TATAPHOTONPLUS on TWITTER. 3. READ THE CLUE EVERYDAY ON TATAPHOTON FB PAGE AND PLAY THE CHALLENGE. 4. SUBMIT YOUR ANSWERS TO [email protected] WITH THE CLUE NUMBER AS THE SUBJECT LINE. SEND IN YOUR ANSWERS WITH YOUR NAME, CITY AND MOBILE NUMBER DETAILS.